Ship, workboat and platform crew don’t have time to micromanage onboard systems. That’s why FCI Watermakers’ commercial grade Neptune+ is the ideal solution for the daily water needs of these professionals. It reliably makes 1,275–9,500 gallons of fresh, pure water every day, without the commitment needed for constant monitoring and adjustments. The heart of the Neptune+ is its next-generation V4 controller and 7″ marine-grade, Bridge Classified and NMEA2K-compatible touchscreen display with intuitive menus and controls. It has type approval certifications from ABS, GL, Lloyd’s Register EMEA, Det Norske Veritas and the Russian Maritime Register of Shipping. Built in the USA, the Neptune+ is available in two configurations. The framed version is easily installed as a single unit. The modular form is perfect for fitting into tight spaces or when access is limited by the size of hatches and compartment doors. Both feature shock mounts for quiet, vibration-free use and an NEMA 4X electrical enclosure. Engineered to run 24/7, only premium components are used in the Neptune+. 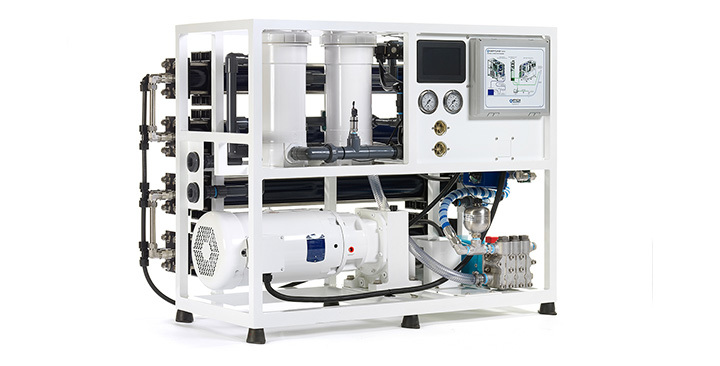 It boasts 316 stainless steel low-pressure and continuous-duty high-pressure pumps. It’s gear-driven, so there are no belts to adjust or replace. FCI Watermakers uses only non-proprietary parts and disposables, for ease of maintenance and lower long-term costs. With the optional Automated Pressure Control (APC) the watermaking process is truly touch free. It auto-adjusts system pressure to feed water conditions and will start, make water, run a diagnostic check, shut down, flush itself with fresh water and come back online—all automatically.